The San Francisco fog zone appeared to be living up to its name this morning so tour guide Gordon plotted us a course south to Monterey. He included an optional wimp-out point at Santa Cruz, though this he described as being a little seaside tacky, sort of Americana Blackpool, in case we were feeling travel weary, together with an optional extension to Carmel should strength remain. To help us find our way there and back, he produced a Garmin Nuvi portable satellite navigation device. It has some battery power but also plugs in to a car’s cigar-lighter power socket thingy. After a few programming bleeps Gordon declared it to be set and ready to guide us to Monterey or Santa Cruz and back. Off to the car with our day packs loaded. We stuck the limpet-like Garmin Nuvi onto the somewhat grubby windscreen and plugged in the cigar-lighter power adapter. The car dutifully burst into life but the Nuvi remained silent. After a few joggles and twists of the power adapter the Nuvi continued to be silent. I tried unplugging it and re-plugging it but all to no avail; the Nuvi remained obstinately silent. Not wishing to be defeated I found what appeared to be a power button on the Nuvi and, after finding the correct length of time for which to press it, another softly spoken American voice, Flossie, greeted us with a map and initial route guidance instructions. Excellent, we were off! The journey down was pretty straightforward. We didn’t really need Flossie but we kept her on because it was comforting listening to her calm, soothing instructions. We were soon sailing past Santa Cruz and on our way to Monterey. Just as we were entering the outskirts of Monterey, the Nuvi signalled that its battery was low and, shortly thereafter, the calm reassuring voice of Flossie disappeared, starved of power, ne’er to return. Clearly, the “on” switch I had found was for battery power and Flossie had never been getting her jolts from the car’s power. We had been cast adrift in a foreign ocean with only our own wits and the stars to guide us. Don’t panic! How quickly one can come to feel dependent upon technological support that is, in truth, fun to play with but is not actually necessary. We’ve navigated our own way around half of Europe on eyeballs and a map, for Heaven’s sake. We chose to stop in the Cannery Row area of Monterey thinking that we might visit its renowned aquarium. After a bite of lunch we wandered around Cannery Row and were thrilled to see a variety of wildlife including seals, jellyfish, pelicans and, most thrilling of all, a sea otter; I’ve never before seen an otter of any kind in the wild. There are masses of kelp growing quite close to the shore in Monterey Bay. The sea otters like to forage in the kelp, too far from shore for the lens of a mere mortal but a sight for sore eyes, nonetheless. 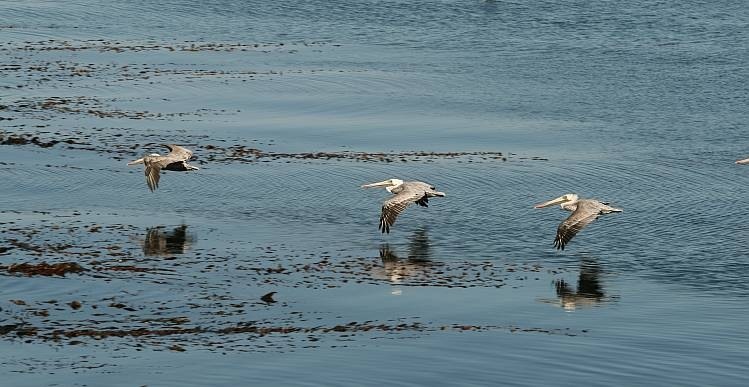 The pelicans are quite a revelation too; they may look ungainly but they actually fly very gracefully and are especially adept at getting “into ground-effect” and skimming just inches above the water. Cannery Row was the centre of a massively successful sardine fishing industry. Photographs are displayed of fishing vessels awash with sardines, their entire deck area quite literally completely obscured by a thick carpet of silvery fish from stem to stern. The success lasted until about 1946 when the sardine stocks suddenly plummeted. The fishing and canning industries were out of business in a relatively few years. The area now survives on tourism. Will we ever learn? The wildlife held our attention for so long that the afternoon seemed to vanish with no aquarium visit. We did, however, hit 17-Mile Drive, a private road belonging to the super rich, as far as Carmel. 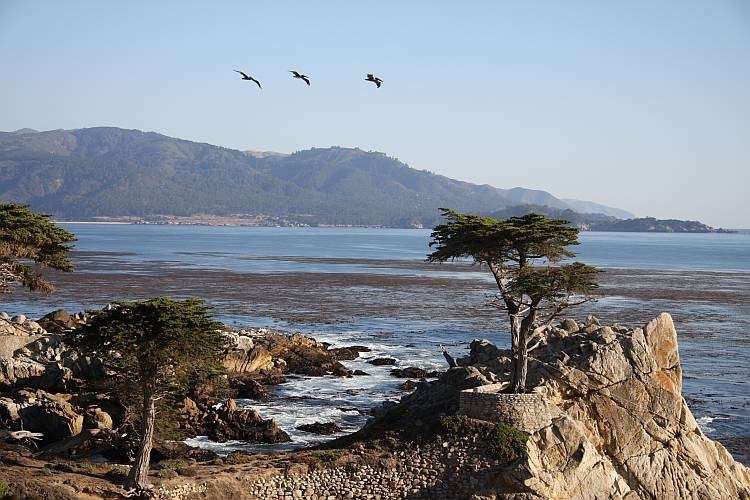 The Lone Pine Cypress on 17-Mile Drive is a well known and much overplayed tourist attraction in this authors opinion. It stands alone if photographed correctly but, in fact, has several close companions which intrude on its loneliness if photographed incorrectly. Does the camera lie or not? The lone shot is certainly the more impressive picture, especially if we ignore the wire cables supporting the tree to ensure its continued tourism longevity. Eventually we began our roughly two hour drive back to San Francisco via the fastest roads. Light faded at about 8:30 PM and eventually vanished completely as entered the outskirts of the city. Now is when we were unable to read road names in advance of junctions and where we really would have benefited from our power-starved technological friend, Flossie. With a combination of logical thought and fortune, though, we found our way back to known territory and a welcome from Gordon and Kim. Wine first, pizza delivery second. All was well. Actually I think it is called the Lone Cypress. 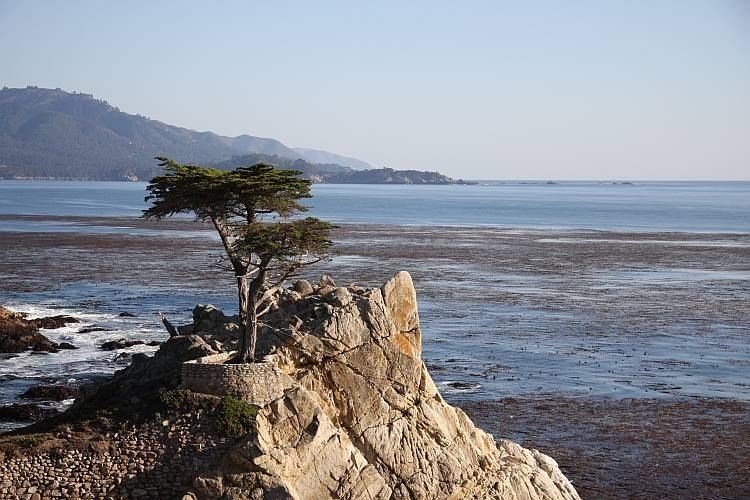 Having consulted the map of 17-Mile Drive, you are quite correct – Lone Cypress it is. I will correct the text. Doubtless, my mind was confused by the old western refrain, “on the trail of the lonesome pine”.